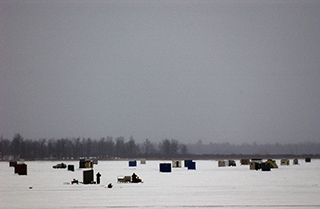 The Michigan Department of Natural Resources reminds anglers that mandatory ice shanty removal dates are approaching. Regardless of the date, shanties must be removed before the ice is unable to safely support them. In warmer weather, the ice quickly can become unsafe for anglers to retrieve their property. Ice shanties: Following Michigan's mandatory removal dates, ice shanties still may be used but must be removed daily from the ice.